I wonder how many Royal Anglians hide their cap badge and pretend they are SAS lol. When I was with 5 Queens, the Royal Anglians along with the Royal Regiment of Fusiliers were part of the Queens Division. I did my infantry training at the main depot Bassingbourne. There was a cracking little pub just down the road from the main gate. I know Bassingbourn very well! Its an Army Training Regiment now. Done quite a few courses there. That pub is now gone. It was put off limits by the Camp Commander so many times, that it went bust. The last time was due to a group of strippers going very OTT with some recruits, and when his parents heard about it, his dad being the friend of an MP (Member of Parliament) the poo hit the fan! I think its been demolished. Bassingbourne was home of the 91st Bomb Group of the United States Army Airforce in World War 2. Thats the group that the B-17, "Memphis Belle" flew with. When I was there last on an NCO's course, there was a bamboo arch which was built at Changi by POW's. Did you see it there Trooper? More to the point, is it still there? A mate of mine served at Bassingbourn when it was a RAF station. Pity about the pub they served quite a nice pint of bitter. That's what young recruits do, get legless and get OTT with strippers. Its all part of growing up and introduction to military life. Which remind's me. Many years ago my mates and I walked into a pub in UK which had a stripper, a beauty queen she wasn't, in fact I think she barked. My mates and I got our pints, sat down and turned our backs to her. She got very annoyed, got off the stage and began to dance in front of us, so we turned around again so our backs were towards her. As far as I can remember she threw her knickers at one of my mates and walked off in disgust. I think her knickers ended up in our mess souvenir cupboard. I can't say I ever saw that. Last time I was there was 1989/90. They were having a reunion of the American Bomber Group when I was there and it was at the same time that they were filming "Memphis Belle" and they arranged for three of the B-17s, and a couple of Mustangs to fly over from Duxford, where they did some of the flying filming from. None of the veterans knew about it and there wasn't a dry eye among them when that fly by happened. I was on the ranges, the 25 meter ranges, not the Barford Road ones, and it was a complete suprise to see the B-17s and Mustangs come over. They couldn't have been higher than 200'. Did you know they did all the exterior "Paris Island" shots for Full Metal Jacket at Bassingbourne? Yes I knew Bassingbourn was used for Full Metal Jacket, I recognised the bloody place which spoiled the movie for me. Also they used Beckton Gas Works (near Dagenham East London) for the final part of the film. If you looked closely, all the wrecked cars and trucks were old British makes, and the palm tree's were set in rubbish skips! I was in Bassingbourne well before 1989/90. I was there about 1972/73, so I guess the bamboo arch has been removed. It was positioned right in front of the HQ building. And the Westland Wessex was not convincing as the Sikorsky UH-34J Sea Horse! I was in Bassingbourne well before 1989/90. I was there about 1972/73, . My dad had a habit of telling me when I was in the RAF "I was in the army when they were needing them, not feeding them." We had a spate of Soviet "Bear" aircraft attempting to fly into British air space and then timing the RAF response time. One weekend I went home on a 48 hour when my dad started his "I was in the army when they were needing them, not feeding them." I then said, "Did you realise there was a Soviet bomber trying to get into British airspace last week?" His eyes opened wide followed by a "WHAT?" I said "Yea, us being fed RAF types turned the bugger back." This is my Wife's Grandfather, Walter McGee Oxford. He was in the Royal Engineers in WWI, part of the 29th Division and fought at the Somme, and at Paschendale. He joined the army in 1912 and went into the North Staffordshire Regiment. He transferred to the Sappers when the war started. 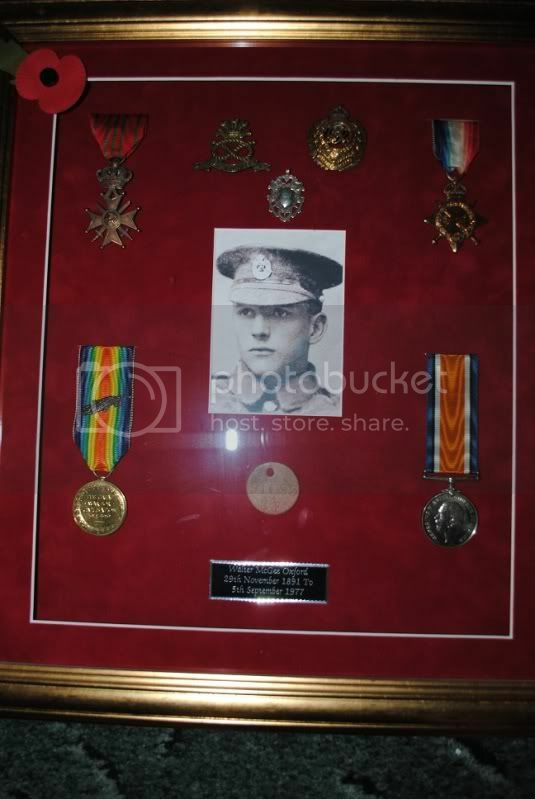 Appart from his campaign medals, he has the Belgian Croix de Guerre and he was Mentioned in Dispatches, but as the RE's records were mostly destroyed in the Blitz, we have never found out why he got the MID. He suffered badly after the war with what we would call PTSD now, but he was a very brave and proud man. After the war he went to work on the railways. In the 1920s he saved a woman who had fallen off the platform infront of an approaching train. He was injured and lost a leg from the knee down. It never stopped him or slowed him down. His picture and medals has pride of place in our home.